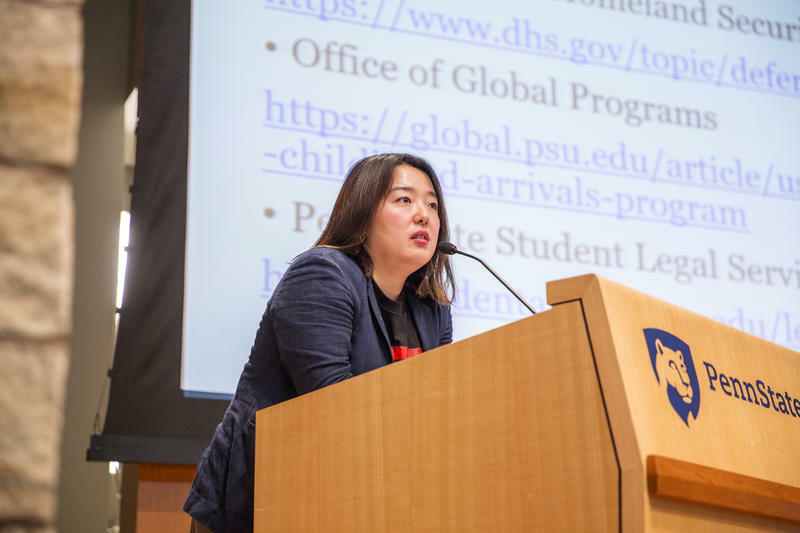 Angie Kim, a community organizing fellow at the MinKwon Center for Community Action and a DACA recipient, spoke to the crowd Wednesday night. She says DACA was everything to her. Kim came to the U.S. from South Korea with her parents at the age of nine. She said she wants people to know when they talk about policy, they are talking about a power to change lives. “DACA meant everything, and all I ever wanted was just the ability to work,” Kim said. Shoba Sivaprasad Wadhia is the Clinic’s director. She said learning about the human aspects of DACA is just as important as learning about the facts. “Hearing the stories of those who have DACA or have been undocumented, as well as learning about the difference between DACA and the DREAM act puts us on a path forward,” Wadhia said.